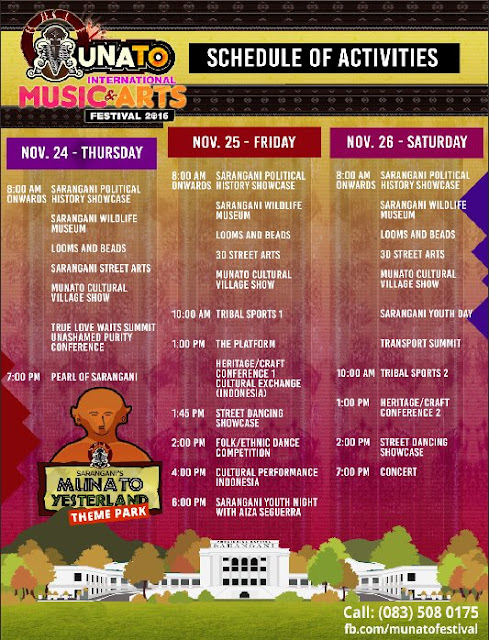 The province of Sarangani is celebrating its 24nd founding anniversary and the 14th MunaTo Festival. 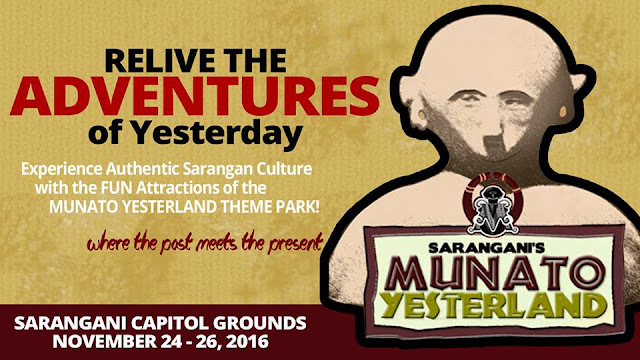 This festival commemorates the birth of Sarangani province with the celebration of its People, Culture, and Treasures. This year’s MunaTo Festival is slated on November 24-26, 2016 at the Sarangani Capitol in Alabel, Sarangani. MunaTo Festival is coined from two Blaan words that mean “First People”. The anthropomorphic jars found in the caves of Maitum (Ayub, Pinol, and Sagel), give clues to Mindanao’s early history and of the Philippines as a whole. The carbon dated anthropomorphic jars depicts that Maitum was the home of early civilization dating back to the Metal age. The original jars are currently in the National Museum for safekeeping and exhibition. Based on the historical time line of the early history of the Philippines, after the Tabon Cave in Palawan, the next earliest pottery is found in Pinol Cave in Maitum. Thus the claim that in Mindanao, the First People or “Munah To”, possibly are from Maitum, Sarangani Province. Sarangani Province was born through the efforts of Congressman James L. Chiongbian in 1992, by the passing of Republic Act 7228. Formerly the area was part of the 3rd District of South Cotabato. It became a separate province on May 19, 1992. Sarangani province is young province with a very long and rich history. 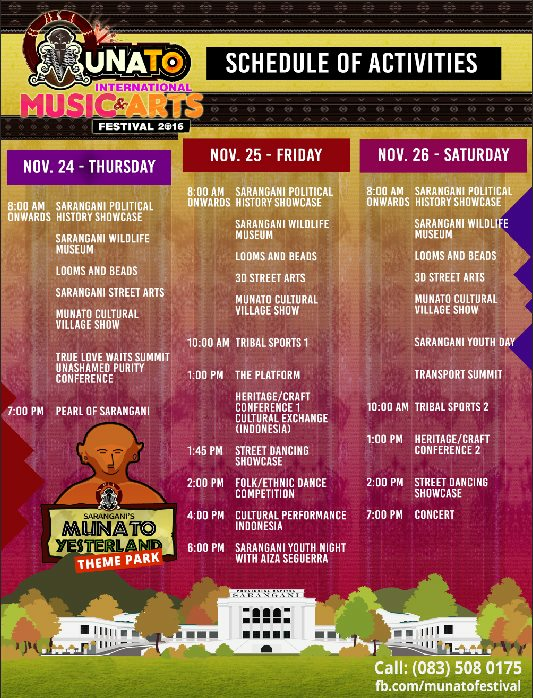 MunaTo Festival is a festival that was conceptualized in 2002. The idea was to create a cultural festival that would celebrate the vibrant diversity of Sarangani Province. It has been celebrated yearly bringing the 7 municipalities of Sarangani together and featuring the best in each town. 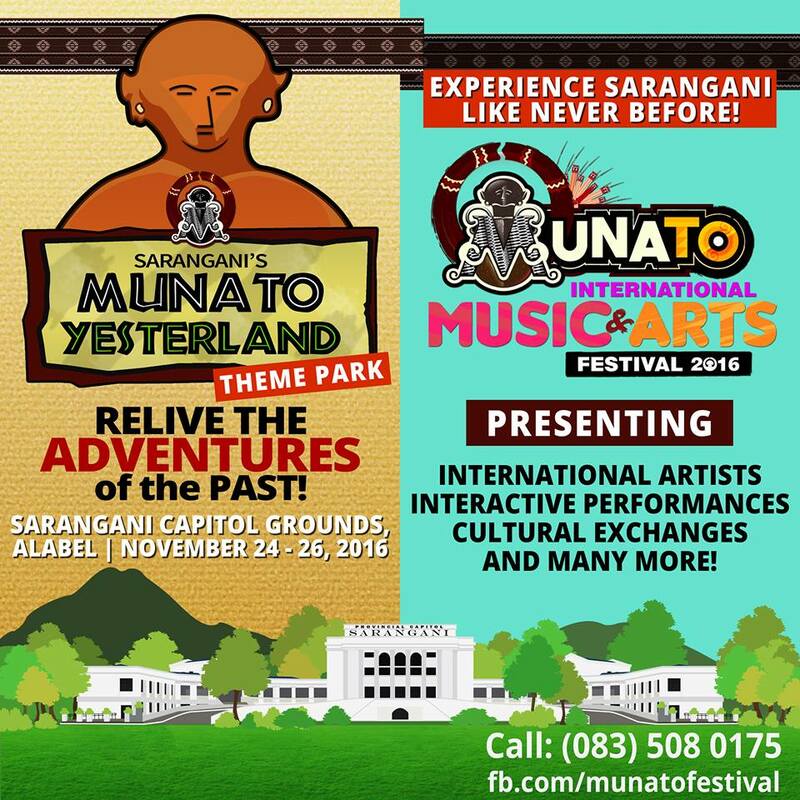 For this year, MunaTo Festival will merge the MunaTo Yesterland and MunaTo International Music and Arts Festival. In 2015 Malaysian Sape Player, Mathew Ngau Jau from Sarawak performed live in Sarangani. This year, the Indonesian Consulate of Davao will be taking part by giving cultural exchange on their instruments and also engage in a music and dance performances. They are also introducing the MunaTo Cultural Village and show where groups will be entertained with Sarangani’s cultural diversity and story called “Thread of Life”. It is a one-hour show depicting different cultural themes celebrated in Sarangani from death to life, and from farming and harvest, and marriage and celebration of peace practices. This one-hour show will then end with the showcase of the authentic food served by the community kitchens of Sarangani. The festival will hold the second run of the PLATFORM IN SARANGANI, whereby great speakers come and share their insights on interesting topics. This year we will be graced with the presence of Secretary Gina Lopez, (former) Sec Raffy Alunan, and PNP General Ronald Bato Dela Rosa. The festival will also showcase Pearl of Sarangani where beautiful young ladies from all 7 municipalities vying for the crown of the most beautiful woman in Sarangani Province. They are also holding the Sarangani Youth Day with over 800+ Youth leaders of the province gather to share their advocacies and make a stand on how they want to shape the future of Sarangani province. Their special guest, Commissioner Aiza Seguerra (National Youth Commission) will be with them and be one of the main speakers. The Munato Yesterland Themepark is showcasing 10 Attractions. 1. MunaTo Cultural Village and Show – This will showcase the Tboli, Blaan, and Tagakaolo and Moro tribes. There will be a show every 9 AM, 11 AM, 2PM and 4PM. This show is called the Thread of Life and sharing in an interactive way their music, dances, chants and stories. 2. Sarangani Wildlife Museum – This is found at the ECPC, where one can see the different animals that are preserved for study. This museum shows the varied species found in Sarangani. Also at the 2nd floor auditorium will play Sarangani- made films from last year’s Salamindanaw’s entry. 3. Looms & Beads - Located at the Kasfala Hall, the Looms and Beads is an extensive, elaborate, and detailed exhibit featuring traditional arts and crafts in Mabal Tabih, Saul (bead works), and other artifacts. This is an exhibit of Heirloom designs and fabrics from our Indigenous Tribes in Sarangani. 4. MunaTo Fotoloco – This is the sculpture of Kublai found at the Sarangani Capitol depicting the first people. Here people can take their wacky and fun photos. A photobooth will be available to take photos for a fee! 5. Sarangani Street Arts – On the back street of the Capitol, several Sarangani artists will create a 3D street art of the different Sarangani tourist destination for those with tickets to take their chance for photo ops. 6. Fabli Guni – Sarangani’s food & handicrafts display and sale. 7. Sarangani Historical Lane – Sarangani gives tribute to all the leaders that have served Sarangani Province since its creation since 1992. 8. Fabli Guni & Farmers Market – This will be the biggest gathering of Sarangani Produce and Products. Included here will be Organic Vegetables, Fruits, Sarangani Upland Rice varieties including ornamental plants, and potteries. Also for sale, will be Sarangani’s processed foods, Aquaculture harvests, handicraft and furniture, fashion, and even Halal foods. This is one full market where you can buy and even deal with suppliers! 9. MunaTo Arcade – This is the section for food and novelty items. Here we will have traders selling snacks, meals, drinks, and other goods. 10. MunaTo Center Stage - Found at the center grounds of Sarangani Capitol. Here free shows and activities that can be viewed by all Themepark goers. This includes the daily parade and mascot appearances, the tribal sports and boxing competitions, magic shows, concerts and Pearl of Sarangani. Everyone coming to the MunaTo Yesterland Themepark can enter for free. However, MunaTo Cultural Village and show will require a ticket to enter for the rate of P100 and this includes the authentic food experience.